I had a great pleasure to play against Eltharis again, this time he brought his Elves of Nature to the table. We played this game under 6.5 version of the 9th Age rules pack. Just look at all these skirmishers! If you also take into account the fact that archers are equipped with Truemark arrows (quick to fire and no penalties for cover) and there will be 4 additional wood pieces then the strategy of this army seems to be clear. 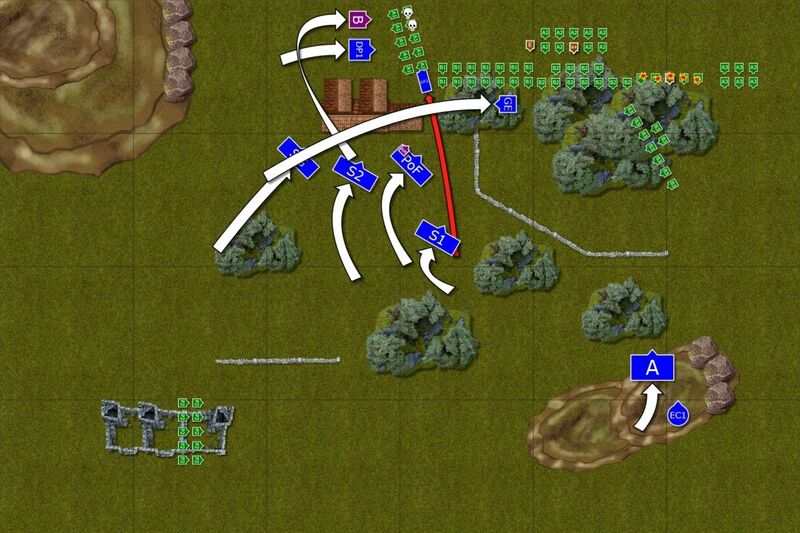 Stay in the woods with the units as long as possible in order to benefit from stubbornness and AP as well as Poison attacks in close combat. On top of that, Bladedancers will be very hard to shift from these forests too so getting to the softer archers and characters is not easy. The amount of shooting this army has is huge. 30 arrows that you cannot hide much (unless blocked by height 2+ models), 20 Pathfinders that can move to even better position and choose right arrows for the job and Glade Bow + magic create quite a nasty situation for T3, lightly armored infantry. In addition, whatever gets to the lines will be intercepted by Bladedancers and Wild Huntsmen. Really tough nut to crack and such defensive army is not easy opponent at all while having a lot of assets against my forces. Please note that I cannot give Bluffer's Helm to Griffon rider anymore. I also decided to use Protectors instead of Lion Guard. 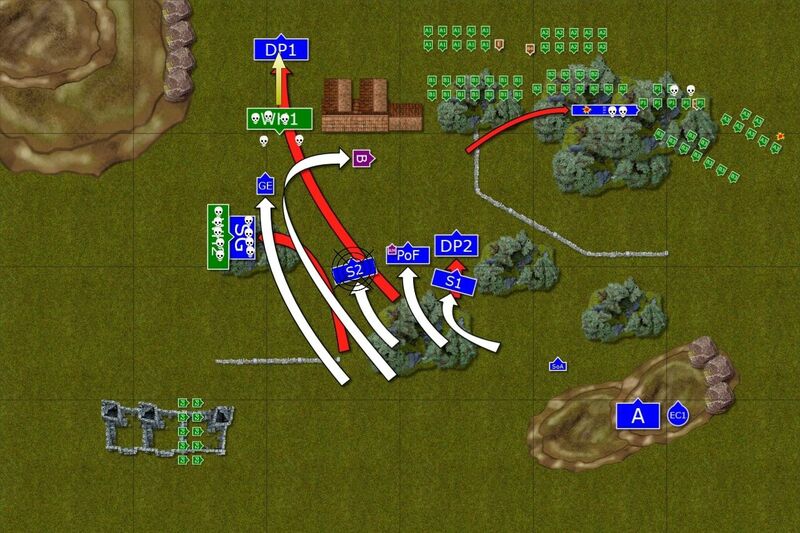 I used them as stubborn regiment on their own to hold flanks but they cannot preform that duty anymore. Protectors would be dedicated unit for the master of paths so that they can benefit from 2+ ward save against spells. That required some savings, however, and a single eagle was dropped, also to give Queen's Guard much needed musician. I had to act fast in this game as I could not engage in a shooting duel. I decided on a gamble that was possible with the new deployment rules. You can see that the terrain was really favorable to Elves of Nature. That was good investment in the Magical Beans and Eltharis clearly designed his army to benefit from its effect. I assumed Eltharis will deploy his army mainly in the top right corner because the huge woods there allowed him to keep entire army there and use it as a good base to jump forward and make stands in the smaller forests in the middle of the board. So I decided to deploy just Reavers to get a some kind of confirmation and when he positioned archers there I decided my prediction was correct. I then simply deployed entire army to had a guarantee of the first turn. I think having first turn is more important here so that I can cover the distance faster. I was also sure I could vanguard forward and not be shot to pieces and I wanted to use that to my advantage as well as will be seen in the opening turns. We rolled classic scenario for this game and when we checked secondary objectives it was "Secure the Target". 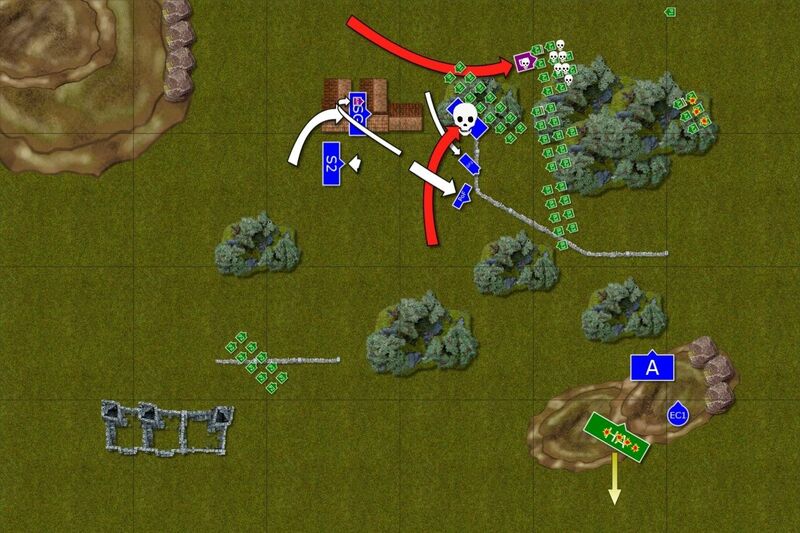 There were two points on the battle field that if secured would add victory points. But in order to do so one would have to use "scoring units". Scoring unit is a regiment with a banner (including bsb) but the one the does not have Free Reform. In this case no unit in Eltharis army could contain these objectives. However, that was balanced by the fact that my own scoring units were too fragile to hold on in the open. I predicted then, that we would focus on killing each other rather than trying to get 240VP extra per objective. Elves of Light moved forward fast but maintained the formation and slowed down the advance only when it was too dangerous. For example, the treacherous woods required caution for the cavalry. Valiant light horse entered the woods at full speed, however, to distract lurking enemy from shooting at the main forces. They paid ultimate price but their companions were determined to avenge them. 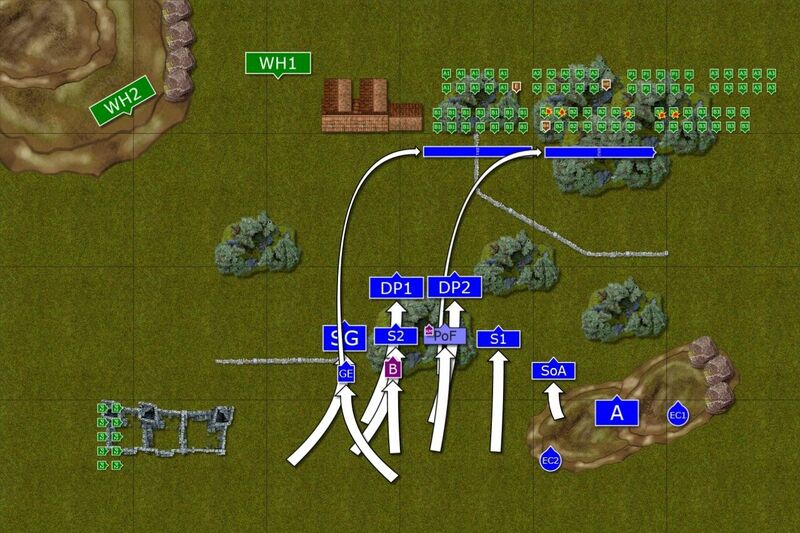 One regiment of Wild Hunters were clearly too hot blooded and tried to charge the enemy cavalry but they misjudged the distance and didn't reach the foe (Edit: I didn't note it on the diagram but WH1 failed their frenzy check and had to charge DP1). Their companions outflanked enemy forces teasing some of them to charge through the woods. 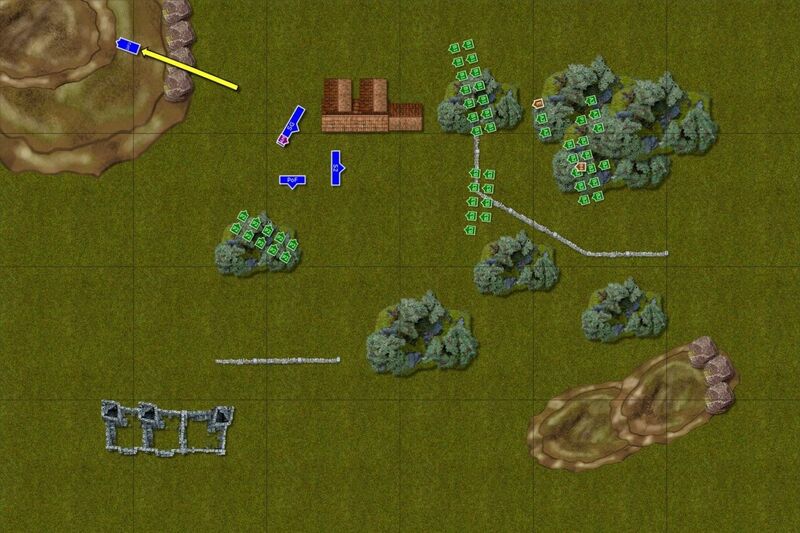 Despite the noble sacrifice of light cavalry, Elves of Nature still had plenty of targets to shoot at. Sisters and Bolt Thrower took the majority of hits and the untimely demise of the war machine unnerved nearby archers who fled to safer position. 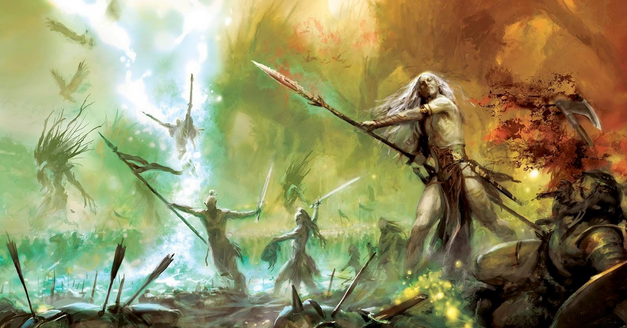 But Elves of Nature suffered some casualties too since their High Enchantress could not contain the magical feedback and resulting blast killed a few warriors around her as well as wounding herself. Remaining light horse attacked exposed flank of the enemy pathfinder with the high enchantress among them but combination of wooden traps and skill in combat of the enemy saw them annihilated. On the other hand, Coastal Guard and the Knights both charged against the Hunters of the Wild. 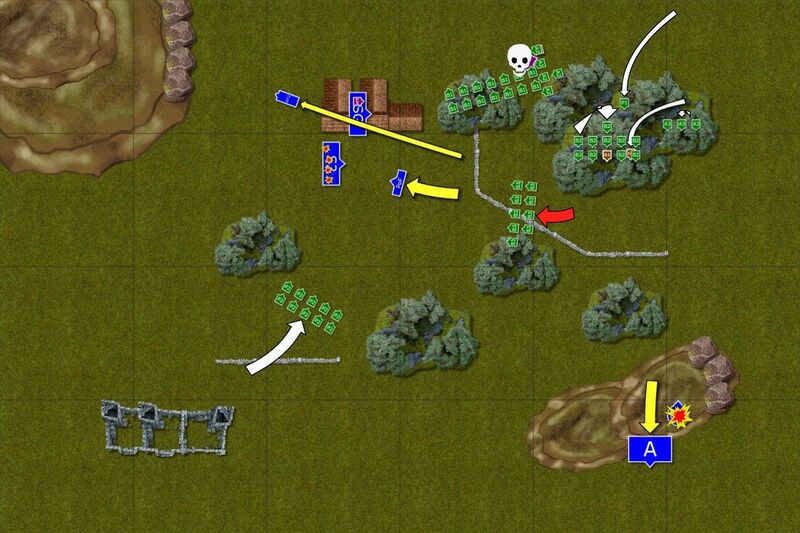 Both units were destroyed although Coastal Guard lost one third of their numbers in the vicious fight. The other unit of the Knights attempted a long preemptive strike against Bladedancers but failed to reach the enemy in time and the rest of the army had to slow down to fall into formation. Elves of Nature only shifted their positions but they kept their defensive formation and stayed under the forest protection. The shooting continued but this time it was not as deadly as opening fire. Outcasts remained disciplined despite heavy casualties and continued their outflanking maneuver with the use of a nearby village as a cover for their advance. They also tried to use their own shooting and magic to hurt the enemy during the advance and managed to kill some Pathfinders and High Enchantress but it was still not enough to eliminate them entirely. Elves of Nature shoot back again! 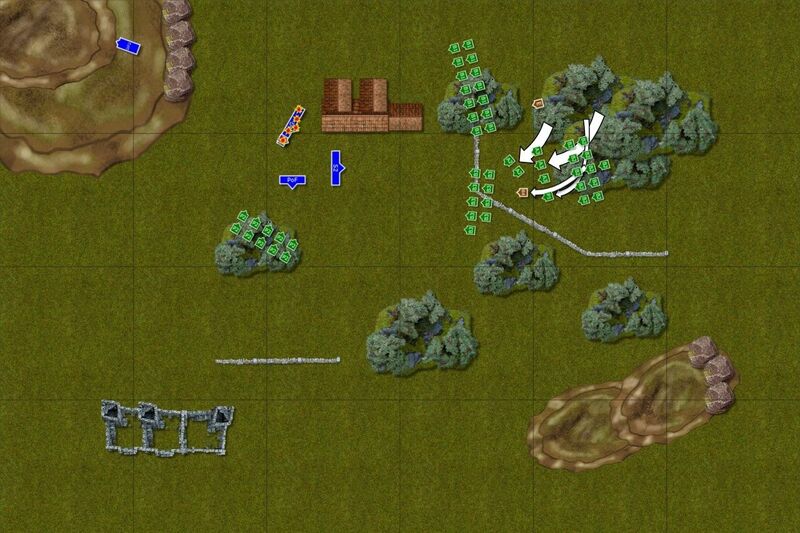 Elves of Nature rearranged their battle line and kept shooting mercilessly. Two not engaged knights fell but fortunately their companion routed some archers who, due to proximity of the enemy, fled from the battle. Then the shooting focused on the Protectors and many gave up their lives to fulfill their duty so that the general remained unharmed. Boosted Thunderbolt at BSB: 3,4,6 + 4 = 17, failed dispel attempt on a roll of 3,6 + 2 = 11 --> d6 = 3, 3 wounds, 2 saves (one 6+ armor, one 6++ ward, lightning attacks didn't wound). 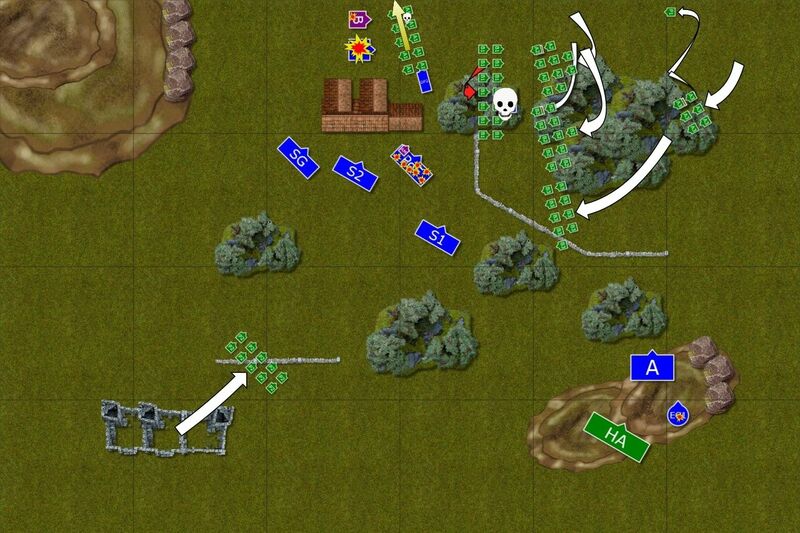 Bob the Battle Standard Bearer spearheaded his attack and charged the group of archers protecting enchantress. At the same time Swordmasters charged in against Blademasters but in their folly they didn't wait for the master of the paths to support them. Blademasters were fighting on their chosen ground and that proved to be a huge advantage. Swordmasters were cut to pieces before they got a chance to strike a single blow. It was a mistake that was about to have even more grievous consequences soon. 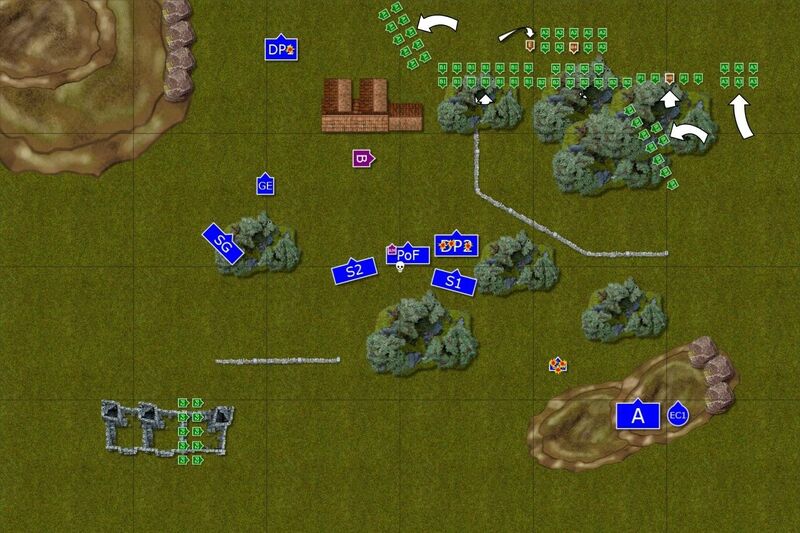 The crew of the bolt thrower had to defend themselves but fortunately a well placed volley at a short range killed enough enemy riders that the survivors fled the battle as swiftly as they appeared. (Edit: I clearly risked a lot with the charge of Swordmasters and that backfired badly. However, there were two things I didn't take into account that I will discuss later in more detail. First, I was not aware that Dancers are I7 not I6. That makes casting miasma on them far more risky than with I6 because I needed only drop of 1 point of initiative to strike at the same time and I was willing to go for exchange here. Second, I was not aware that Griffon lost thunder stomp and couldn't inflict that many casualties as I have hoped for. Bladedancers, now free to attack again, charged the flank of the griffon rider. Surprisingly, they inflicted only a single wound but the archers added one more and the enemy battle standard was captured. Griffon rider tried to catch enchantress before he died but he managed to wound her once only. It went even worse for the heavily depleted Elves of Light as they lost another war machine and Archers panicked again. It was no clear that they will have to fight for the very survival from now on. It is all in the hands of Master of the Paths now. Archers decided the cause is lost and didn't rally. Single knight could not rally either and even the Protectors tried to get to safer position. It was then up to Larry and a few Coastal Guard to gamble to get some dignity back. Bladedancers charged respective units but enemy general made a good use of the village to cover his retreat and it was down to the shooters to claim some victims. 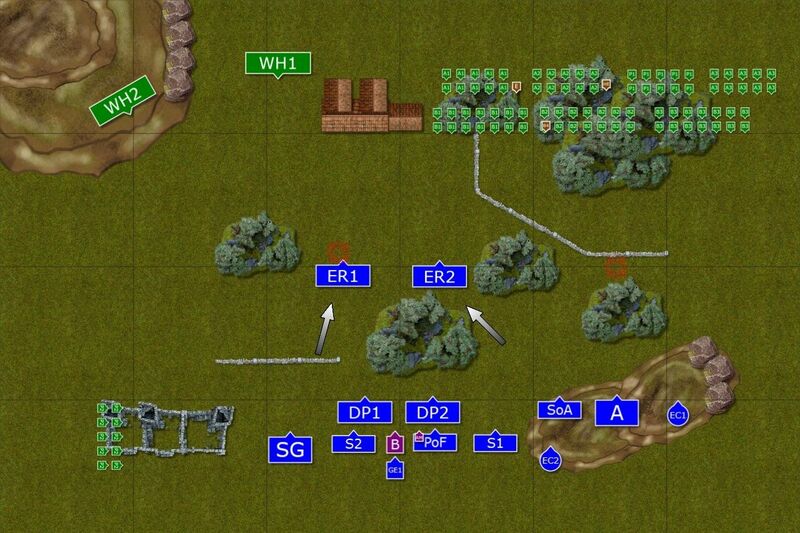 With the obscured line of sight now it was more difficult to do so but the enemy army melted dramatically anyway. The few survivors made a last stand and allowed Larry the Path master to cast his spells but despite his best efforts they were not nearly as efficient as they could have been. Now they grimly awaited the last volley. Coastal Guard dies but the General lives! With no ability to charge the remnants of the outcasts, Elves of Nature used their formidable shooting to try and hunt their general down. However, he miraculously managed to survive, although his bodyguards died to an Elf. It was clear that the assault on the forest failed and Elves of Nature repelled the attack. In the end Eltharis got well deserved victory and I wanted to congratulate him on his win! He had a very good plan and used his army in a disciplined manner and played to his strength very well. I don't have the result somehow but rough estimate suggests that he won by around 500VP which is much less than I though I lost. And that is why I am so disappointed with myself because as I am going to show you my mistakes cost me a lot when I could have really avoided some of the poor decisions. I was happy I decided to deploy my entire army as I think having first turn was very important. I could also use my vanguard and fast cavalry to limit the shooting efficiency of the enemy. Eltharis still inflicted a lot of casualties but not against the assault units that was very important. I was also very happy to eliminate Wild Hunters soon. I know Eltharis thought they are initiative 6 but they are not and that allowed Coastal Guard to hit at the same time. I got two killing blows in the process that helped in getting the wounds through as otherwise 4+ save would have been very handy here. I knew I had to be disciplined and do not waver under the heavy fire and I believe the approach was not to bad until turn 4 where I made the crucial mistake of charging Swordmasters against Bladedancers. The fact I lost a unit for nothing was not a problem, the issue was that the enemy now could charge my BSB. Otherwise, I was happy to have him in combat as that allowed him to avoid one turn of shooting. If I didn't charge with Swordmasters I would have been able to finish the Archers (if I didn't forget about the attacks of the griffon) and possibly charge the depleted units with the wounded High Enchantress. In addition, if the griffon survived, it would would be enough to get a draw so basically that mistake cost me the game. Why did I risk so much then? Well, I was really sure that dancers are I6. If I succeeded with magic then we would have probably decimated each other. With the benefit of a hindsight I see it was too risky even if that was true (i.e. dancers with i6). I should have waited a little bit longer for the better opportunity. However, the reason I thought the risk is worth taking is that if I did succeed in my plan then Eltharis would be at a back foot with his fragile characters running out of places to hide. What I should have done instead is I should charged lonely Knight along my BSB to inflict more casualties and also to protect his flank. I have some additional impressions on the core rules after this game but some might be actually after all the games I have played so far. I am not sure what seem to be the reason but all the games I have played so far are very long. I know it is partially due to UB as online chats take longer. however, it was not the case before. I also know it is not because of learning new rules as I had few discussions about them. Choosing the scenario and secondary objectives as well as new way of deploying may take more time now. 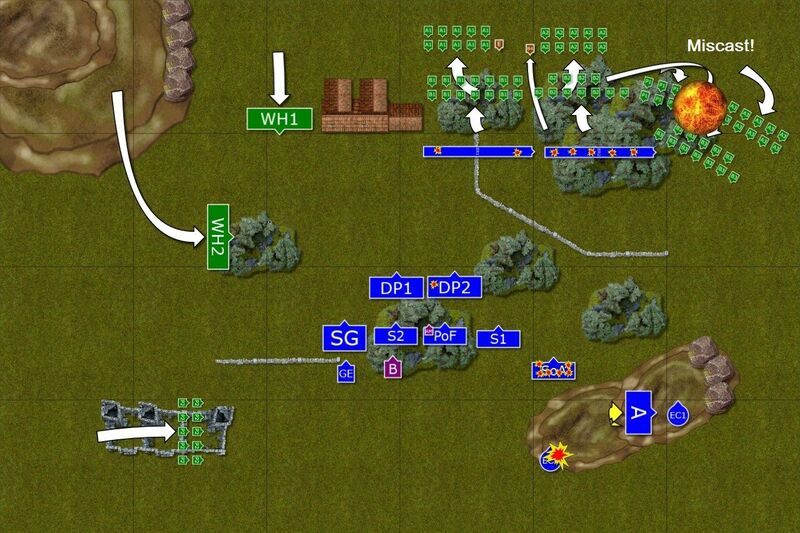 Especially, that I have found out that the description of the secondary objectives is only in the scoring section where, in my opinion, it should also be in the description of the deployment. I simply wasted time trying to recall where they were. You may think it is a small thing and people would remember these rules soon but it does not mean the access to the information cannot be better. I mentioned during the game that if I knew about some changes I would have made different decision. I find it frustrating that playing in 9th Age often means that previous experience is not only obsolete but can even lead to disastrous decisions. It is ok for a new player to make such mistakes but it should not be the case for somebody who played 150 games in the system that should be essentially the same, just better. I don't know how to address that. Technically, it is up to a player to know the rules. It is true the changes are in different color in the rules too. However, there are so many of them that it is simply hard to recall them all. Or one would not assume they changed at all. For example, the whole discussion and announcement of the new type of monsters class like griffons didn't even suggest there are changes to stomp rules. Or while it may be a good idea to add +1 to the initiative for additional hand weapon it does not seem to be the most pressing matter in streamlining the core rule set. My conclusion here was that by adding a lot of changes at this stage, not necessarily those that solve pressing matters or the biggest offenders, you generated a rule set that is equally complex and convoluted as the 8th edition. The difference being that the complexity may just lay in a slightly different area of the game. 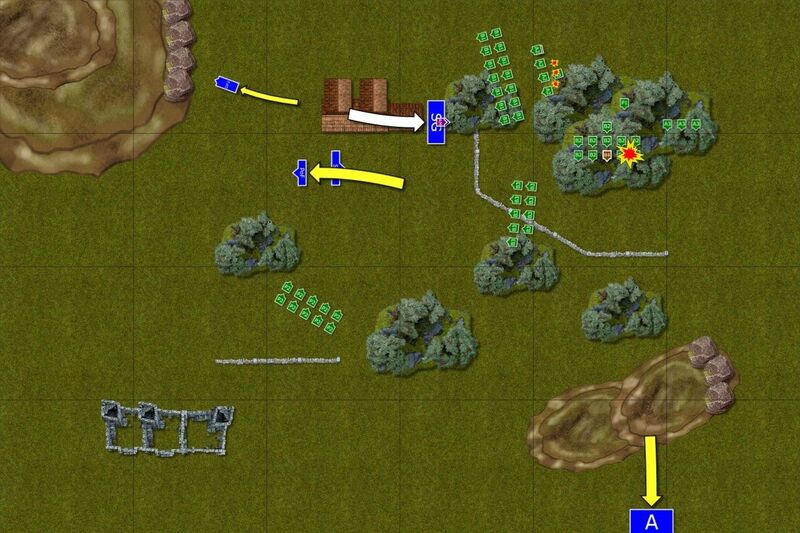 I like the options of the new deployment and the idea of the secondary objectives. However, in the games I played so far the secondary objectives didn't play important role, both armies still focused on killing each other instead of trying to secure them as priority. I understand that the nature of secondary objective may not be to be the primary mission (hence the name) but I hoped it would affect the outcome or army list composition. 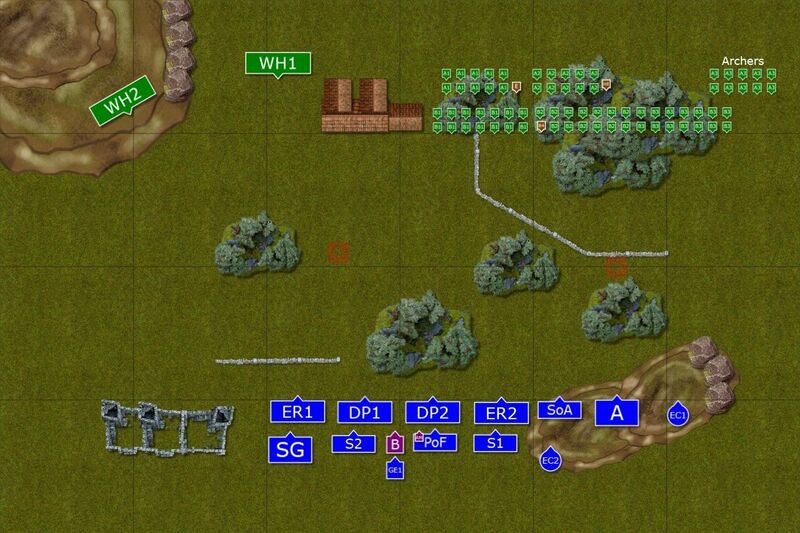 Please note, that my opponent didn't even have scoring units but with the composition of his army he could easily shoot to pieces any regiment of mine that would attempt to sit on the objective. Thus, neither army had a slightest incentive to actually even think about them. I observed I don't cast spells with more than 3 dice and would not risk using more to get overwhelming power because it is not a guarantee of a success anymore (still can be dispelled) but at the same time can be much more damaging. As a result I cannot push for that one spell per game as before, where I can get it off. I miss that and I don't think it was such a power abuse as it was in the case of 6-dicing Dwellers or Gateways by more powerful wizards every turn. It also means my spells get off less often because I either fail to cast the more difficult ones on 3 dice or simply my opponent has better chance to dispel them with fewer dice too. Other than that the game does not seem much different yet. Even more so when I observed the armies other people play and the way they play them. I hope it will change with the work done by respective army teams. I can say now, that I see a good sign based on what Elves of Light team did and I hope other crews are doing equally good job. I decided to try and provide the feedback on the army I fought against as I hope it will also be helpful to other teams to create the most balanced army books. 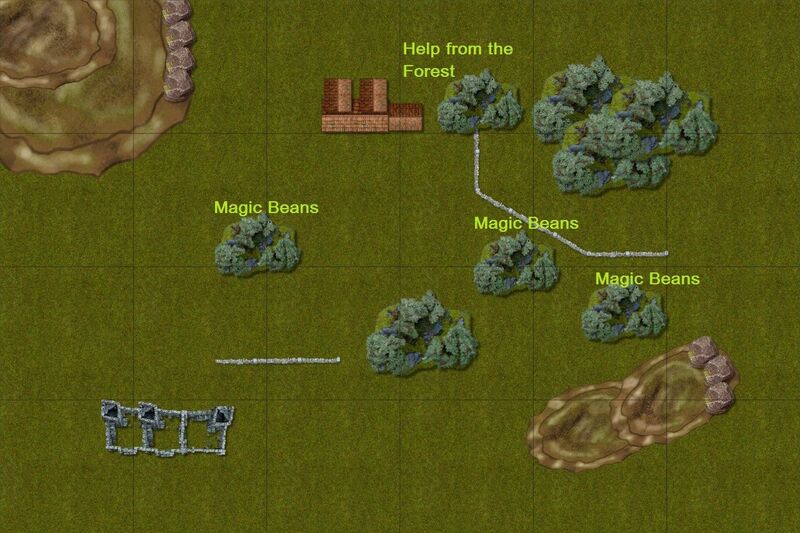 Eltharis based his strategy on the fact that he was sure to get 4 forests with the special rule he had for his army and the investment in the Magical Beans. It happened we had even more woods for him on this battle field but I think it is clear one can base a strategy on such a safe bet. It helps defensive armies of course and uses the ability to have whole army with skirmishers to great effect. There is absolutely nothing wrong with such approach. It creates a tough army to break through that still is not much hindered by its own units. At least for type of forces like mine as I don't know how hard it could be for the forces of different armies and approaches. It is of course possible, that the fact I decided to aggressively advance made my opponent to choose defensive stance and against another foe he would be more dynamic. 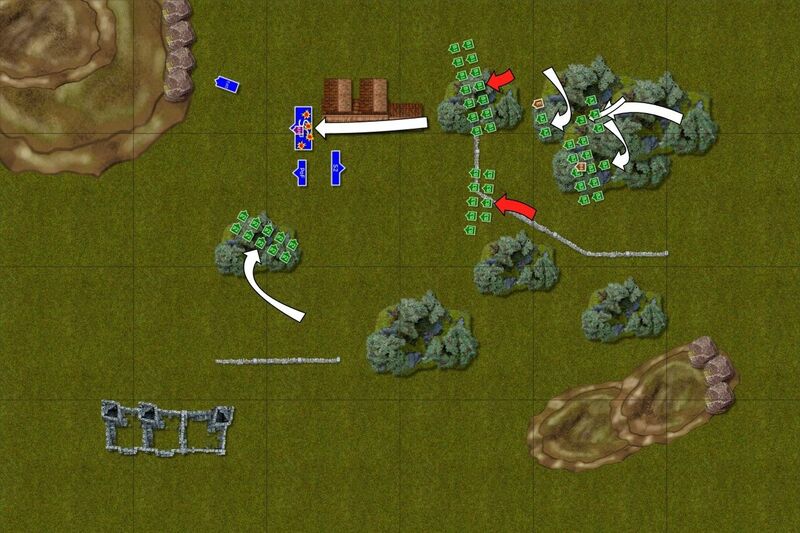 In any case I find it very useful for the Archers to be able to skirmish because they are extremely mobile as infantry and that does not affect their shooting abilities, provided they choose right arrows. Combination of quick to fire and skirmish is fantastic because it makes for 40" effective distance with no penalties for movement. Then cover is also not a protection either. Having protection of the Bladedancers was awesome as I could not comfortably attack them with any unit of mine at all. At the same time my own shooting was limited due to skirmish + soft cover combination. It required indirect approach but still cost me a lot during the advance. I was trying a few new things with this army and wanted to share some impressions. Griffon Rider - I am still getting used to the fact how much that model changed. No terror, slower, no thunder stomp, no ability to upgrade it to former ASF (extremely helpful) but combined profile helps. I wish I could keep the Helmet but as far as I now I cannot give it to large targets anymore. I liked the fact that apart from 18" range for BSB effect I have also a quick, hard hitting but not overpowered model that is perfect reserve unit. Unfortunately, he became very expensive with far smaller potential on the attack. As a result I started thinking about having a separate eagle rider and pedestrian BSB for similar cost but much better flexibility. The good thing is that at the time of writing there is a new draft now that provides some solutions. Hopefully, that will be approved for official release. Coastal Guard - I always liked them and I am glad they have heavy armor and killing blow with spears. They are still fragile but I like the fact they are reinforced for aggressive use. Protectors - still not sure about them. I just need to train more to get these 4+ saves done! :) I need to re-think what I really need in this army but they are quite good as a dedicated bodyguards for the general, especially that he carries MR(2) item. Other than that I am happy with the army as it is. The only thing I don't like with the existing rules is the fact that two models with Supernatural Reflexes but the same WS hit each other on 3+ anyway. I don't think it is right from any point of view. Thanks for reading! I know it was quite a long report, especially with the added text after the game but I hope you liked it anyway! I must admit, all of the rules updates are getting to be a litte daunting to read through - personally, I think that the fewer changes we have the better, to avoid issues like the ones you had during this game. But I'm still hopeful that I'll like the "end" result. I would love to see small steps approach too but they have already released the beast and now they have teams for each book working in parallel so that should work in the end. I am sure the fact I started using the rules as they are, in a WiP form, adds to confusion and occasional frustration. However, I play against absolutely fantastic people so that makes me want to come back and keep playing too! We will see how the project is going to evolve.